To get back on track after vacation is one of the toughest task. Although, me and hubby back to office and kids back to school, it takes atleast a week's time to overcome vacation hangover and get back to routine with million things, especially my cooking. Now with "S" bday around, how can I sit back and laze around. Decided to enter my cooking mode as soon as possible and that led to browsing through my recipe books and bookmarks in search of a recipe to prepare something special for him on his special day. I got charged up as I came across the video bookmarked for later viewing. This video from Anjum Anand with BBC cookery show 'Indian Food made Easy' demonstrated the recipe of "Savoury Semolina Cake". The cake though savoury, I knew it was the perfect treat I could make for the bday boy. 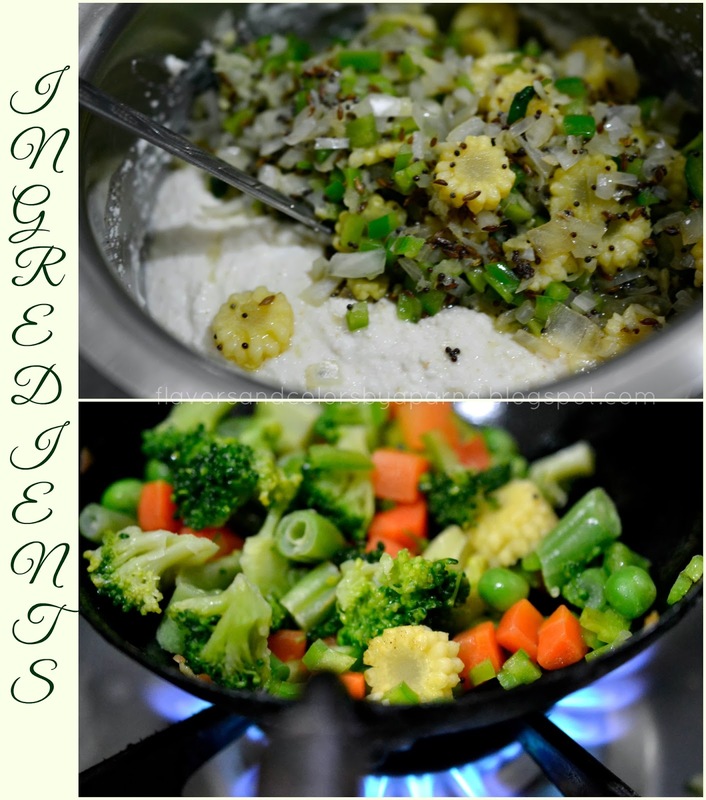 Many food bloggers had attempted her recipe which is very easy with use of easily available ingredients and involves simple process of mixing. 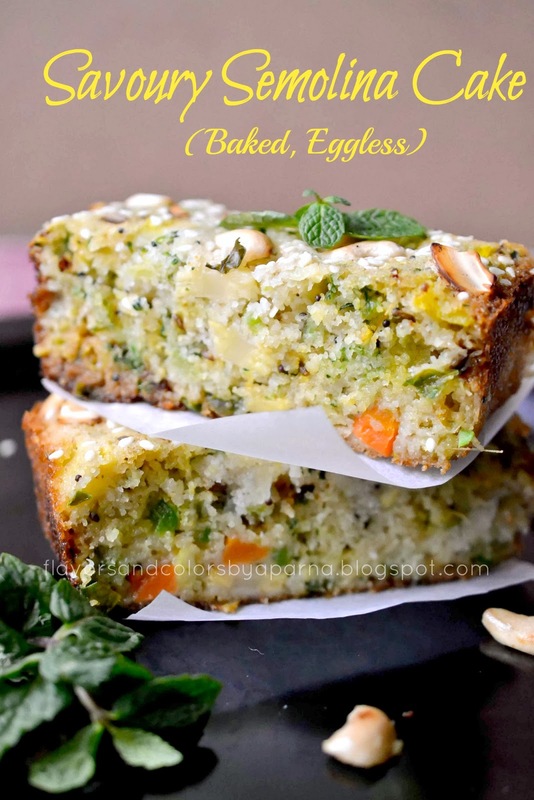 The best part being the recipe is eggless and is healthy with lots of vegetables and no butter at all. I was damn sure, baking this recipe was the instant cure to my post vacation blues and went ahead to try it. Served the cake slices with hot tea and I am glad that though an unusual way, I could prepare this savoury treat in time to celebrate the occasion at home. We relished having the slices with hot tea and kids with flavoured milk. The below recipe has been adapted from Anjum Anand video, here and here. Preheat the oven at 180 degrees Celsius. Prepare the loaf tin either by applying oil or placing a butter paper. Mix together roasted semolina, whisked yogurt, grated ginger, asafoetida and salt. Add water as per the required consistency and make a thick batter. Add red chili flakes, 1 tsp of sesame seeds, finely chopped coriander leaves, mint leaves. In a pan, heat oil. Add mustard seeds, when they splutter add cumin seeds and wait for them to pop up. Next add curry leaves, finely chopped onions and veggies and saute them for a minute on low flame. Stir this tempering into the above batter and mix well. Finally stir in the baking soda and transfer the batter into loaf tin. 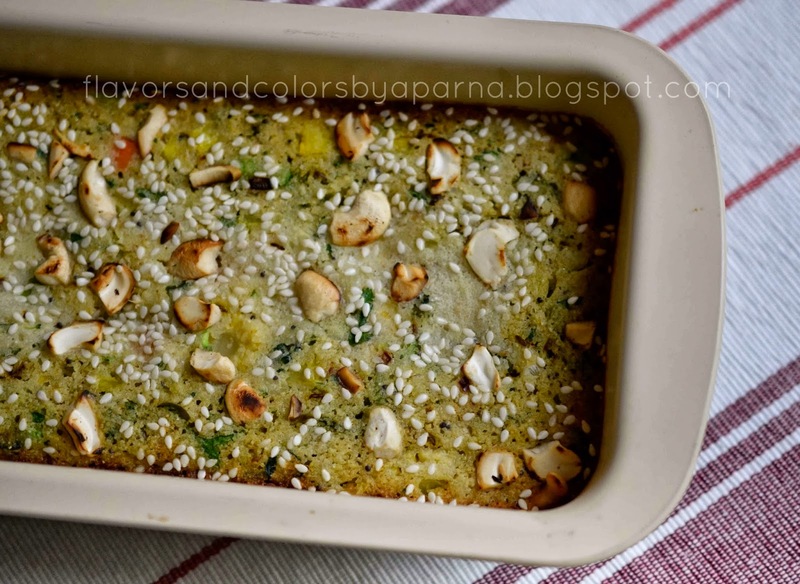 Sprinkle toasted cashews and 1 tsp of sesame seeds on top of the batter and bake in preheated oven for 35-40 minutes or till a skewer inserted into the centre comes out clean. Remove from the oven and allow it to cool. Slice and serve as it is or with sauce/chutney. These slices serve as great tea time snacks. You can use any vegetables of your choice and skip the use of chilies/chili powder when served as snacks to kids. You can add turmeric powder to get a distinct yellow color or grated beetroot to get a distinct pink color. 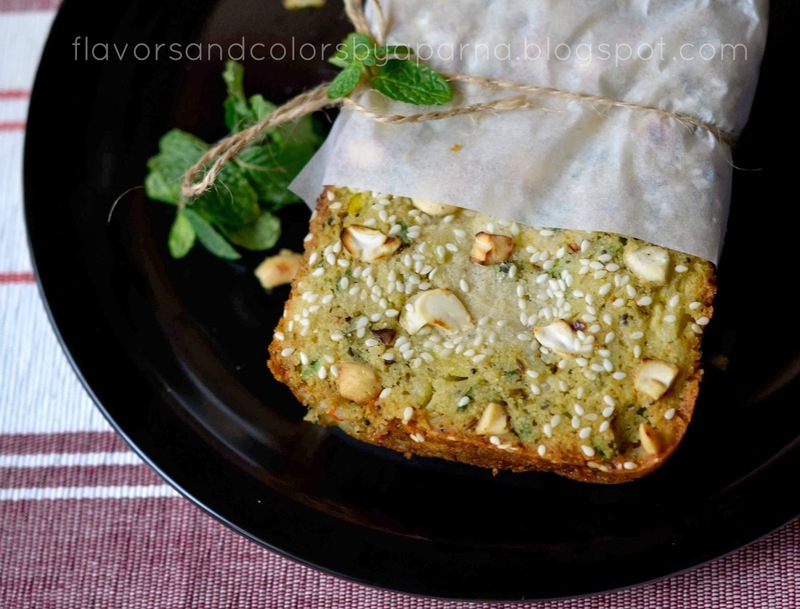 Sending this entry to Holiday Baking (Cakes and Cookies), Let's cook with Green Vegetables, New "U" 2014 events and Dish it out - Light Dinners series started by Vardhini of cooksjoy. This looks healthy and inviting. Thx for linking. Healthy, delicious and the perfect tea time treat. I've always wanted to try this yours looks well done.First time here.Love it. @ Vanmala: do try it ,, a bite of surprise and it tastes DELICIOUS ! looking delicious....will try... what size loaf tin u have used ...?? ?